Leading restaurant furniture supplier collaborates with new American fusion restaurant and wine bar for a successful grand opening by supplying it with new American made restaurant chairs. Leading restaurant furniture manufacturer and distributor Restaurant Furniture Supply recently helped Austin area new Sobani new American fusion restaurant and wine bar to a successful grand opening by supplying it with new wood restaurant chairs made in the USA. Sobani is a contemporary, new-American gastropub and gluten-free restaurant. It is located in Lakeway a suburb of Austin, Texas. The chef showcases his creativity by creating unique new American and Asian fusion dishes. Sobani which means "neighborhood" is a restaurant that focuses on farm to table, thoughtful cuisine. Local farmers supply the ingredients for most the completely in-house crafted menu selections. Visits to the farmers market help ensure local-freshness of these ingredients. A full bar is available where customers can explore handcrafted cocktails and an extensive wine list. The dining room is sleek and contemporary, with polished concrete floors and a wall of windows opening to the outside patio. Small details like blond wood accents and music playing make it feel inviting. Sobani also has a patio for outdoor seating which is dog-friendly. "As a venue that brings in a wide variety of customers and experiences heavy traffic every day, Sobani was looking for stylish chairs that add to the restaurant interior’s sleek, modern image," Affordable Seating sales representative David explained. The owner of Sobani Restaurant and Wine Bar turned to Restaurant Furniture Supply because of their reputation for excellent quality and customer service. He ordered Restaurant Furniture Supply ‘s elegant Premium US Made Window Back Wood Chair in dark mahogany finish with buck vinyl padded seats. The Premium US Made Window Back Wood Chair is made in the USA. It is constructed of solid maple wood responsibly harvested in the Midwest. The Premium US Made Window Back Wood Chair sells for $80 on Restaurant Furniture Supply’s website. A matching bar stool is also available for $93.The chairs and bar stools come in 6 standard finishes and a custom finish can be made upon request for an additional charge. Customers can choose between a padded seat which is made from American foam and vinyl or fabric or a solid wood saddle shaped seat. The padded seat can also be custom made from any material and a custom finish can also be made for an additional charge. "The Premium US Made Window Back Wood Chair was perfect for what the team at Sobani was looking for," David said. "The Window Back Wood Chair is comfortable and functional, with long-lasting durability and is reputed for its fine craftsmanship. To complement the solid wood chairs, the owner bought Restaurant Furniture Supply’s Solid Wood Table Top in dark mahogany finish with eased edge. All of Restaurant Furniture Supply’s solid wood table tops are made in the USA from responsibly harvested Midwest maple trees. Prices for Solid Wood Table Tops start at $79. Browse Restaurant Furniture Supply's full selection of commercial grade chairs, bar stools, table tops, table bases, booths and patio furniture at http://www.restaurantfurnituresupply.com or talk to a customer service representative at (888) 346-9992. 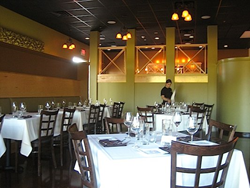 Sobani Restaurant and Wine Bar is located at 1700 Ranch Rd.629 in Lakeway, TX. They can be contacted at: (512) 266-3900.